Towpath Trail Cuyahoga National Park. Photograph Courtesy of the National Park Service. 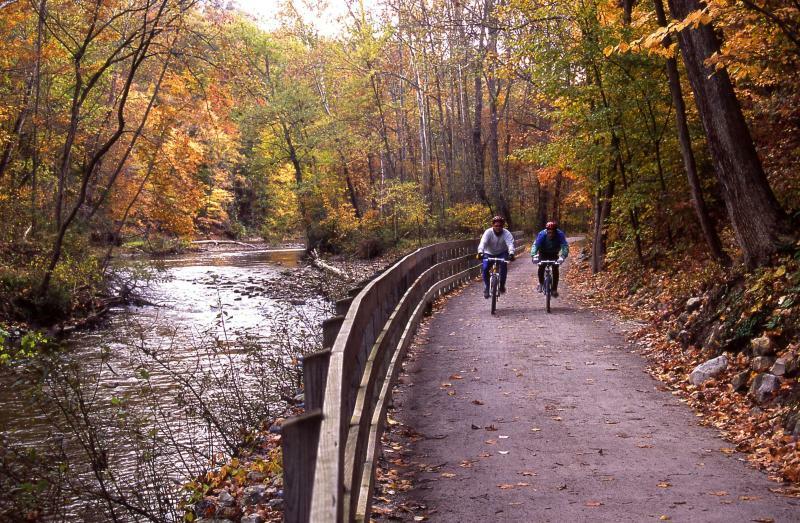 What is now the Cuyahoga Valley National Park in Northeastern Ohio, was originally created as a national recreation area in 1974 to serve the cities of Cleveland and Akron. The establishment of the 33,000 acre park was part of a larger National Park Service initiative to protect recreational open space in urban regions. The park preserves a largely rural landscape along twenty miles of the Cuyahoga River. As in all parks located close to where people live, management strategies are complex and constantly evolving. The central spine of the park is the river and a canal towpath trail. The Ohio & Erie Canalway National Heritage Area designated in 1996 incorporates the full length of the canal that stretches 110 mile both to the north and south of the park. The heritage areas’s popular Towpath Trail links to other regional trail systems and attracts 2.5 million visitors a year. The park works in close partnership with the two organizations that mange the heritage area and even has explicit authority to assist the heritage area with projects that are beyond the park’s authorized boundaries. 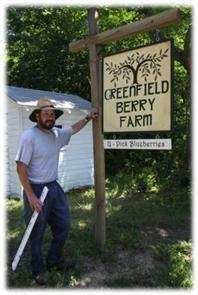 Another partnership strategy was designed to bring back farming within the park boundaries. Historically, the land within Cuyahoga Valley was primarily used for agriculture, but by the late 1990s less than 4 percent of the land was still farmed. As a result, farmsteads were being converted to other purposes and the agricultural character of the valley was being lost. Although farm land acquired within the national park was preserved as open space, it had fallen out of production and lost its meaning as rural cultural landscape In addition the associated farm buildings also began to deteriorate and these historic resources were at risk. Inspired by the European approach to maintaining working agricultural cultural landscapes in protected areas, the park launched an effort in 1999 to reintroduce farming. A new non-profit organization, the Cuyahoga Valley Countryside Conservancy, was created to coordinate this initiative and bring necessary technical expertise on sustainable agriculture as well as support the re-use and adaptation of farm properties. In this model, the park owns the farm and grants a long term lease to farmers conditioned on the use of sustainable farming methods and the opportunity to offer educational opportunities to park visitors. Preserved Farm Cuyahoga National Park. Photo Courtesy NPS. The goal was to re-vitalize 15 farms averaging 100 acres or less; at this time ten farms, each with their own specialty focus, are participating in the program. The Countryside Conservancy’s role has expanded beyond providing long-term assistance to farmers to engaging the community through a variety of programs and activities. These include working to support farmer’s markets, organizing local food swaps, and offering educational programs on farming practices and food production from cheese making to brewing. The farms within the park serve as showcases of sustainability and the conservancy’s programs build awareness the value of local agriculture throughout the valley. The park also has engaged the community and community partners in a watershed stewardship program. Water quality in the Cuyahoga River suffered for over one hundred year of industrial pollution. A fire on the river in 1969 made international news and spurred the environmental movement and related legislation in the 1970’s. Using the section of river that flows through the park as a test case, local communities have implemented watershed improvement plans. The results have been a demonstrable recovery in water quality, which has inspired stewardship through out the region. All of these approaches show how our national parks can continue to reinvent themselves and manage resource on a landscape scale — if they have the right partners.